This Sugar Cookie Body Scrub recipe is a sponsored conversation written by me on behalf of Amopé®. The opinions and text are all mine. 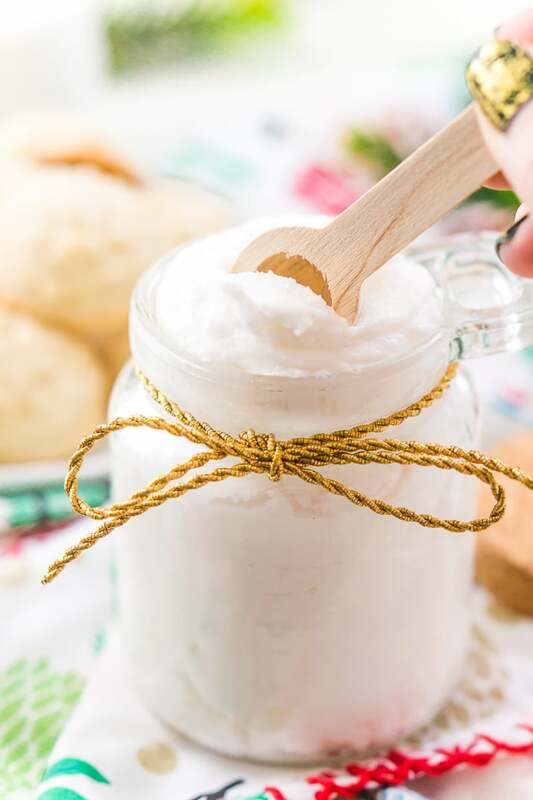 This Sugar Cookie Body Scrub is made with sugar, coconut oil, and fragrance oil. You’ll love how easily this 3-ingredient DIY gift comes together! Add it to a holiday gift basket with slippers, nail polish, and chocolate for a fun foot spa-themed gift! Aren’t homemade gifts just the best? And this Sugar Cookie Body Scrub might just be the best one out there! You can make it yourself and use it with the Amopé Pedi Perfect Foot File. I love making and giving body scrubs as gifts during the holidays because it’s the time of year when our skin can use an extra bit of loving, especially our feet. A must-have on my list this season is the Amopé Pedi Perfect Extra Coarse Electronic Foot File! This is the time of year when my feet are at their worst and the combination of the body scrub and foot file leave my tootsies feeling like they’ve spent all day at the spa. The extra coarse roller head of the Amopé Pedi Perfect Extra Coarse Electronic Foot File has long-lasting micro-abrasive particles and now comes with finely ground diamond crystals. It buffs away hard skin leaving you with visibly touchable feet. I’ve been using the Amopé Pedi Perfect Extra Coarse Electronic Foot File for a couple of years now and it saves on trips to the salon for manicures. Since using this product, my feet feel soft all year long! Now that’s a gift worth giving! 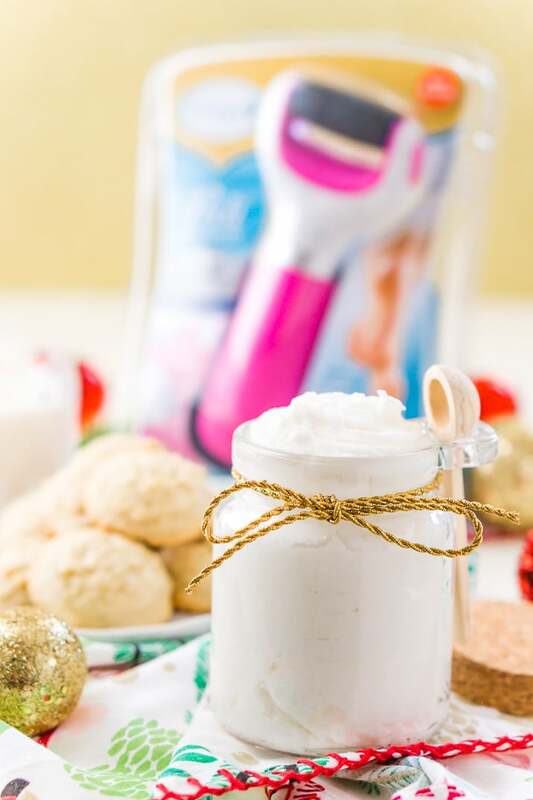 After using the Amopé Pedi Perfect Extra Coarse Electronic Foot File, scrub them down with the Sugar Cookie Body Scrub to leave them soft and moisturized as well as smelling just like sugar cookies! But don’t just treat yourself, treat your friends and family too by putting together some great gift baskets for them! Putting together fun gift baskets with a mix of store-bought and homemade goodies is one of my favorite things to do! Amopé Pedi Perfect Extra Coarse Electronic Foot File – For soft and touchable smooth skin! 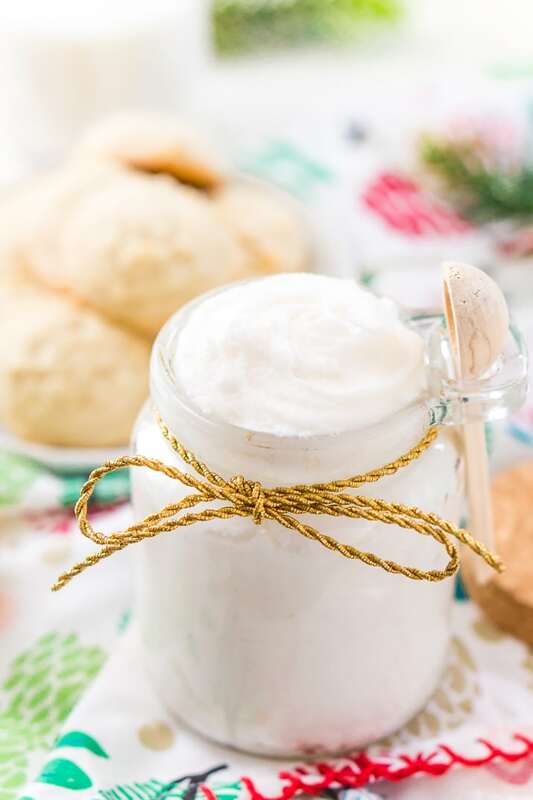 Sugar Cookie Body Scrub – Moisturizing, exfoliating, and great smelling! Nail Polish – Pick fun and festive colors for the holidays! Slippers – Keep those feet warm and comfortable all season long! Chocolate or Cookies- Because… sugar. Cute Jar – If you’re planning on packaging this recipe up and giving it as gifts, cute jars are an absolute must! These cute little Weck jars are my favorite but these Kate Aspen Jars are great too! Ribbon – I love using baker’s twine on mine, but any thin ribbon will work! Coconut Oil – There are a lot of different coconut oils out there, you’ll want to use a refined coconut oil, this means it doesn’t have a coconut scent or flavor to it. 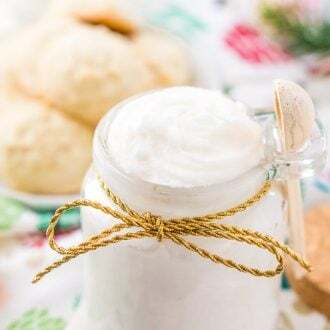 Sugar Cookie Fragrance Oil – For a really strong and amazing scent, you’ll want to use a few drops of fragrance oil, I love this fragrance oil set, so many amazing scents and you can use them to make my Gingerbread Sugar Scrub and Peppermint Scrub too! Who in your life would enjoy a fun spa themed gift basket with the Amopé Pedi Perfect Extra Coarse Electronic Foot File and body scrub for the holidays? Or better yet, get one for all your friends and have a spa party to relieve all that holiday stress! 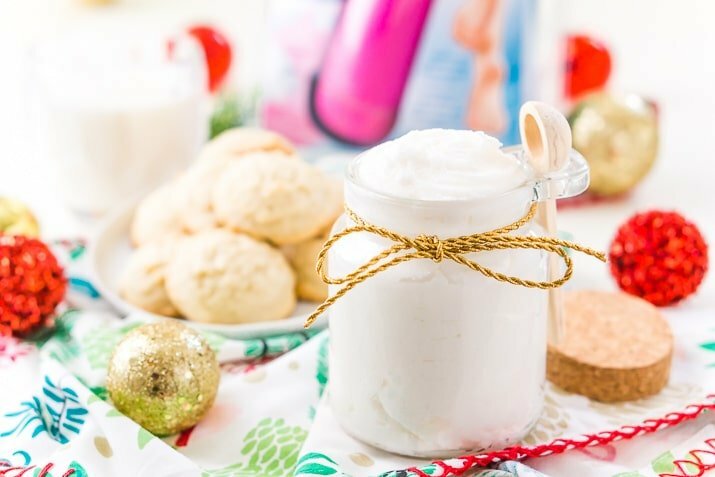 This Sugar Cookie Body Scrub makes a wonderful holiday gift! 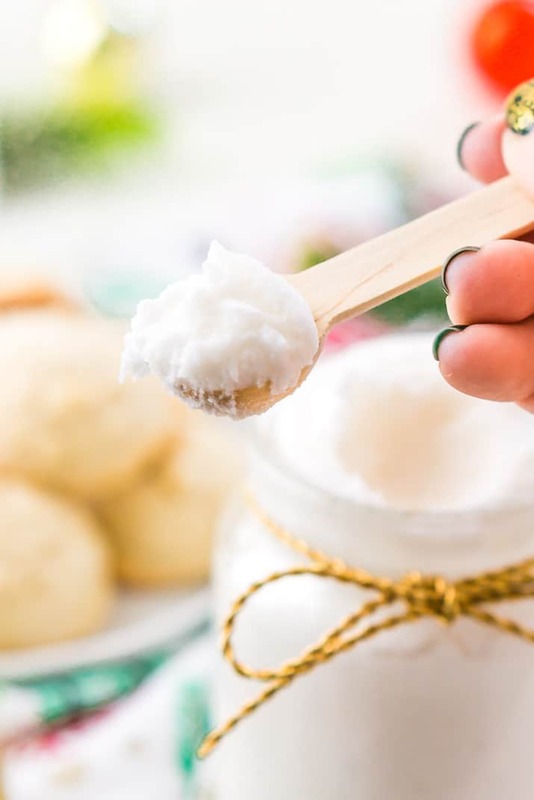 Made with sugar, coconut oil, fragrance oil, you'll love how easily this 3-ingredient DIY gift comes together! Pin this Body Scrub for Later! I’ve never tried making my own body scrub, but after reading this, and seeing your beautiful photos, I think I will be giving it a go very soon! Great idea for a homemade gift! Thanks for sharing! You won’t regret it! Your skin will feel amazing! Yes, it smells to good! What a fun idea! A great way to pamper yourself or gift it away! I so have to give this a try! I love a good sugar body scrub but always get them from the store – betting this homemade version is way way more enjoyable! Yes and a whole lot cheaper too! Hi Keira, I would recommend keeping in a warm area, so room temperature would be great. If you put it in the fridge, the coconut oil will harden and if it gets too hot the scrub could separate.